The first five minutes of the first class leave a strong first impression. On this page you will find ten different techniques & activities to start your semester with a positive tone, build a strong classroom community and set clear expectations for students. Unforgettable Neighbors - Pass out index cards to students and have them write a word that is descriptive or significant to their interest. Tell them that it has to either rhyme or start with the same letter as their first name. Then ask students to talk to a neighbor and explain why they chose the word. Finally ask for a few volunteers to introduce their unforgettable neighbor. Collect the cards at the end so that you can use them and refer back to them throughout the semester. 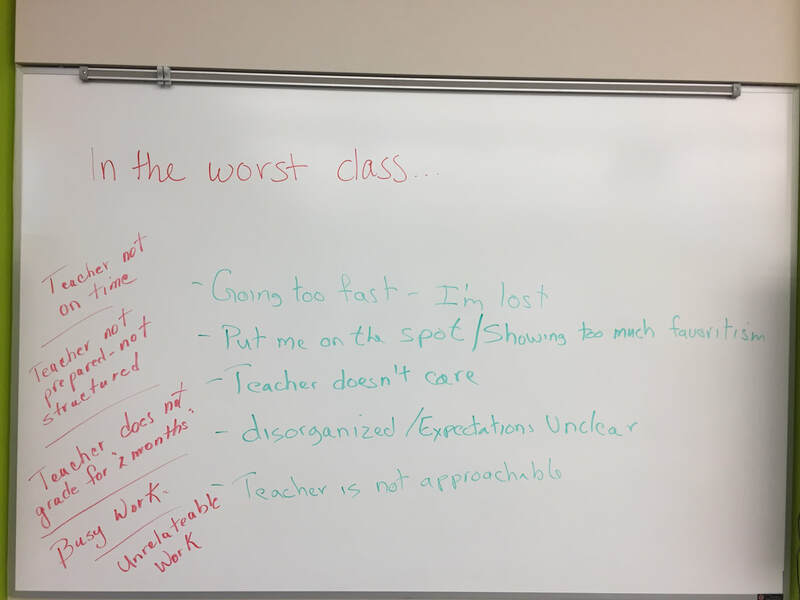 Best Class / Worst Class - On the board, write “The best class I ever had…” on one side and on the other, write “The worst class I ever had…”. 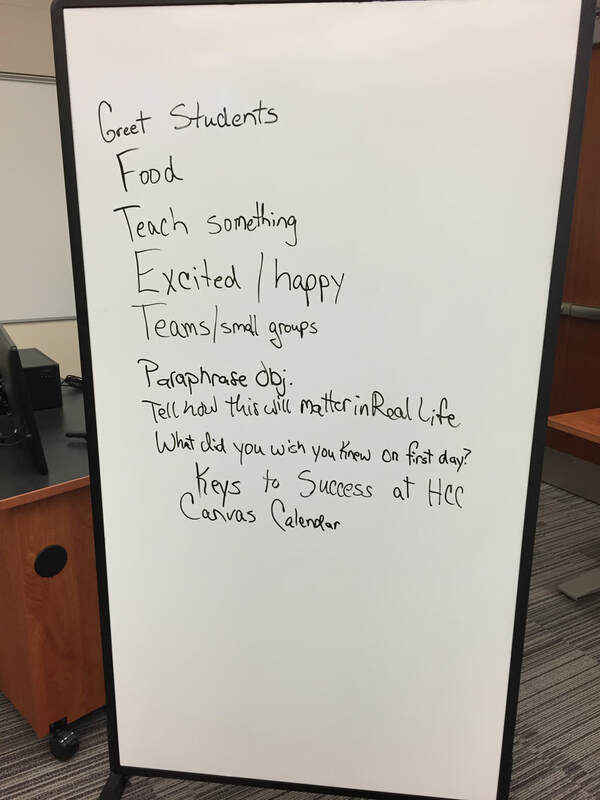 Ask students to come up to the board and write down some things that made the best class so good and what made the worst class so bad. Discuss as a class and compare their answers with yours as the instructor. Then agree as a class to not do the worst things (as long as it’s reasonable) and to strive to incorporate the best things into your class as much as possible. Syllabus Speed Dating - Split students into groups of 3s or 4s. Then assign each group a different section of the syllabus. Have each group create 2-3 multiple-choice questions based on their section of the syllabus. Then have students find a partner that was not in their group and have students quiz each other on the questions they each came up with. Students should give the correct answers after their partner guesses. Repeat this 2-3 times so that each student will have had 3 partners that were not in their own group. Then come back together as a class. Ask students what important information they learned through this activity and discuss any questions that come up about the syllabus. Reinforce any important information that was not covered in the discussion. Collect the questions at the end. Teacher’s Choice - Explain why you chose the book you’re using and what its strengths and weaknesses are. Tell students how you are going to use it and how you want them to use it. How should students read the book? Should they read from the first page to the last page of each chapter or should they focus on certain sections within the book? How are you planning to use it? What will their required readings be and how long should they be spending reading the book? Are there any interesting or important facts about the author that might be relevant? How should they take notes? Student Survey - Create a Google Form (or a printable Word document) that you can give to your students. Ask them to self-assess their knowledge of core concepts or requisite knowledge that they should have for your class. Ask students what you can do to support their learning and give them space to tell you anything that might affect their learning or performance in your course during the semester. You can also use part of the survey to give a pre-test for upcoming content. Teach 1 Thing! - Make sure you dedicate time to start teaching content! Make sure you do at least one activity that is representative of what students will be doing throughout the semester. This is your chance to set classroom norms - if you want them to stand up and move during activities, start having them do this early so that you face less resistance later on. Use the link above to view a sample student survey. Feel free to make a copy of this survey for yourself. ​Contact mstein@howardcc.edu for help with Google Forms. Have students write on the board what happened in the best class they ever took and what happened in the worst class they ever took. What did the teacher do? What did their classmates do? What did they do? What made the best class so good and what made the worst class so bad? Then discuss as a class and create a behavior contract with students based on these things. 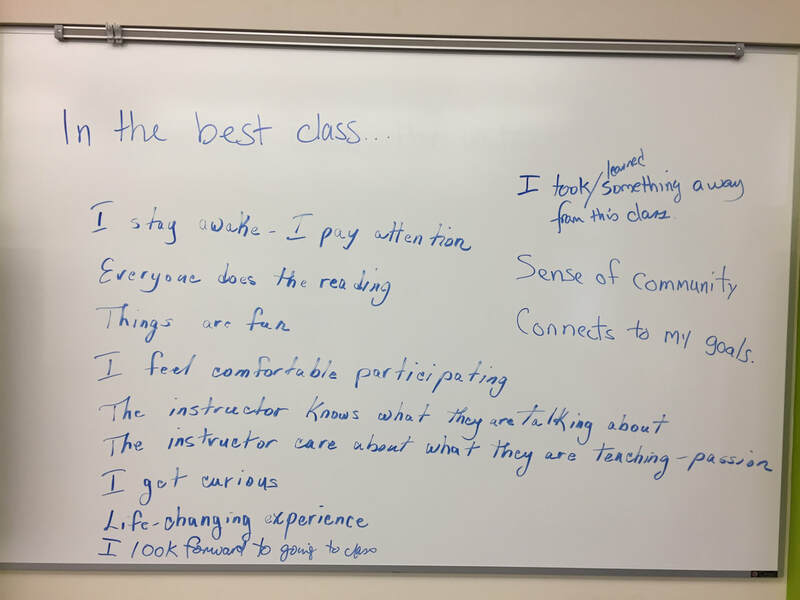 The instructor should add their own experience with what students do to make classes good or bad as well and both students and instructor should come to an agreement to do the things from the best class and not to do the things from the worst class. Greet students at the door - don't let students in the classroom without greeting them and making eye contact. Introduce yourself and ask them to tell you their names as they come in. Bring some chocolate or a small snack to make students comfortable while you go over some of the mandatory information (policies and procedures). Teach something on the first day! Be excited and happy on the first day. Show students that you are excited about the class and are enthusiastic about the material. Put students into teams or small groups from day 1. Tell them to exchange contact information - phone number or email addresses - so that they can contact each other for information and to study together. Ask students to paraphrase the objectives for the course in their own words so that they understand what they will be able to do by the end of the course. Tell students how this course will affect their lives and how your course plays into the world around them. At the end of the semester, ask students to write a letter to incoming students taking this course next semester. What do they wish they knew on the first day? What are the secrets to success in the course? What advice would they give to incoming students? Hand out/post copies of the letters to students on the first day of the new semester. Encourage them to write their own questions about the course after they review the letters. Show students how to use the Canvas Calendar so that they can keep track of all their assignments and when things are due.